Quite a rare sight off peak in general, never mind on a weekend: 395007 leads 395005 working 1J37 12:53 Margate – St Pancras International on Saturday 3rd December 2011. 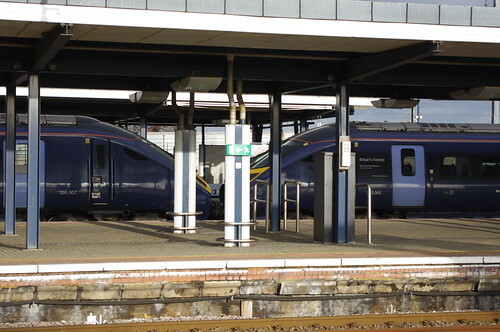 I do not know why this was formed of two units and the previous St Pancras train which had come from Dover Priory was only formed of one unit. This entry was posted on Tuesday, November 6th, 2012 at 10:03 pm	and is filed under Electric Trains. You can follow any responses to this entry through the RSS 2.0 feed. Both comments and pings are currently closed.